This has been a long time coming, friends. And by a long time, I mean a looooooooong time. Last spring I was asked by Shanna of Illustrated Faith to be a contributing devotional writer to an upcoming kit, and guess what? THE KIT IS HERE! Goals with Grace released at DaySpring last week, and all the words and dreams and heart eyes have come to life! 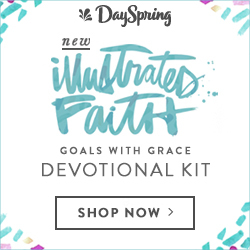 Goals with Grace is a 14 day devotional and Bible journaling kit that focuses on starting 2017 with our eyes on Jesus as we make our plans that will pave the way toward our hopes and dreams. Each day is a new goal-setting prompt and scripture with space to decorate in the journal itself and ideas to get you going in the margins of your Bible. It's still a bit surreal to see my face in this thing and to be tagged in pictures of the pages made in the sweet Bible journaling community! Y'all are rockin' it already! Now, I can't guarantee that all of these things will be in every kit moving forward, but I'm in love with the changes so far and hope to see them repeated! I think my favorite new additions are the tip-ins, shown above. Tip-ins are pieces of cardstock the size of the wide margins of the standard journaling Bible, and they can be attached with washi, glue, or used as bookmarks that can be removed. The picked some of the dominant images and phrases from the devotional to put on the tip-ins, and I can't stop playing with them! I definitely plan to use them in a multitude of ways! Here's a look at my first page done from the first day of the devotional! I couldn't help but trace those sparkly pink sneakers right into the corner! My biggest prayer for this devotional is that it will point you to Jesus in all of your endeavors. 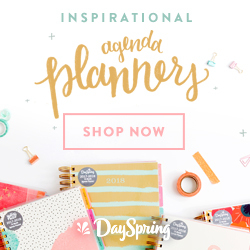 I've learned a lot about goal setting and intentional living from a lot of amazing people, and it has been a joy to share with the Bible journaling community. Man, this really is a dream come true. Let's get after these goals with grace together!